Tiruppu, Tamil Nadu: Indian Prime Minister Narendra Modi on Sunday hit out at the opposition alliance, questioning why they were combining against him when they claim his government was a failure. Referring to the coming together of opposition parties of various hues, Modi, addressing a rally in Tamil Nadu’s Tirupur after inaugurating a slew of projects, described them as an “adulterated alliance” and “club of rich people” seeking to promote dynasties. “Nobody knows the agenda of the opposition alliance and they don’t have worthwhile answers to any question,” the prime minister alleged. “The only answer they have for all the questions is ‘ask Modi’,” he added. Alleging that the opposition was good at spreading panic and misleading youths, farmers and other sections of society, the prime minister said for a long time opposition parties had created tension in society over the issue of social justice. He criticised the Congress’ farm loan waiver scheme saying that it would not benefit anybody but would result in an extra burden of Rs500 billion, while his government, for the first time in India’s history, had announced a Rs60 billion per year income scheme for farmers’ holding less than five acres of land. 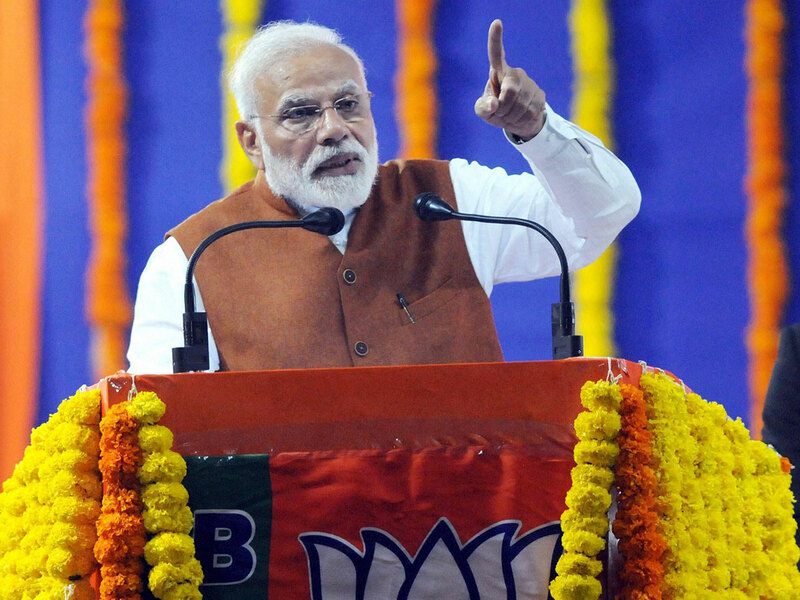 Modi on Sunday launched a host of new as well as completed projects in Tamil Nadu from here as he kicked off his 2019 election campaign in the southern states of Karnataka, Andhra Pradesh and Tamil Nadu. In his last stopover at Tiruppur — a major export hub for knitted garments, about 470km from Chennai, Modi laid the foundation of a 100-bed Employees State Insurance Corp (ESIC) health facility. The brief function in Perumanallur village was also attended by Tamil Nadu Governor Banwarilal Purohit, Chief Minister K. Palaniswami, Deputy Chief Minister O. Panneerselvam, Union Minister of State for Finance Pon Radhakrishnan and others. The PM also dedicated to the nation, a 470-bed ESIC Hospital and the Bharat Petroleum Corp Ltd’s Ennore Coastal Terminal in Chennai. He also inaugurated a crude oil pipeline from the Chennai Port to the Chennai Petroleum Corp Ltd (CPCL)’s Manali refinery in Chennai. He also flagged off a passenger service between a 10-km section of the Chennai Metro Rail — AG-DMS Metro Station to Washermenpet Metro Station.